We are a family owned business, operating locally for over 85 years and now spanning four generations. We are located in Kamo on the north side of Whangarei with a fleet of vehicles ranging from 21 to 53 seats. 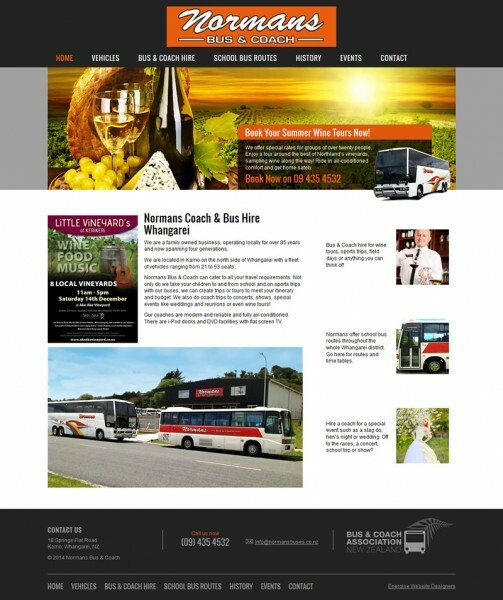 Normans Bus & Coach can cater to all your travel requirements. Not only do we take your children to and from school and on sports trips with our buses, we can create trips or tours to meet your itinerary and budget. We also do coach trips to concerts, shows, special events like weddings and reunions or even wine tours! Our coaches are modern and reliable and fully air-conditioned. There are i-Pod docks and DVD facilities with flat screen TV.